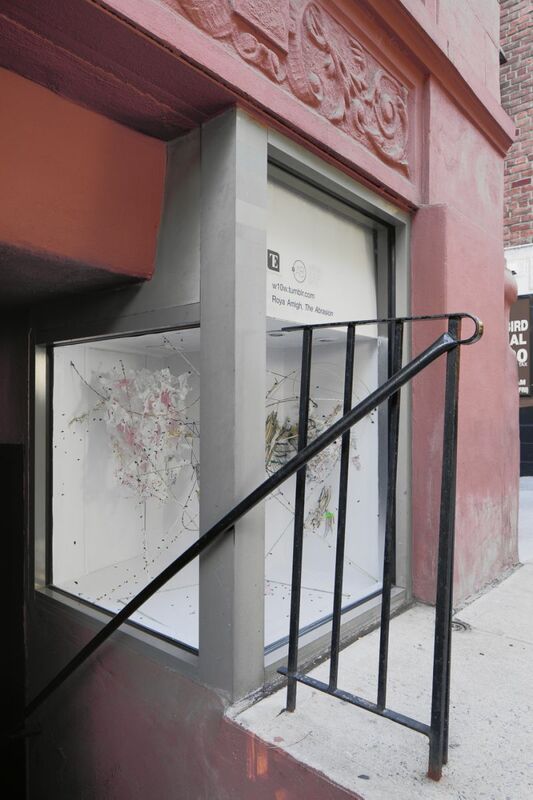 Time Equities Inc. Art-in-Buildings is pleased to announce the newest exhibition at the West 10th Window: Roya Amigh, The Abrasion. 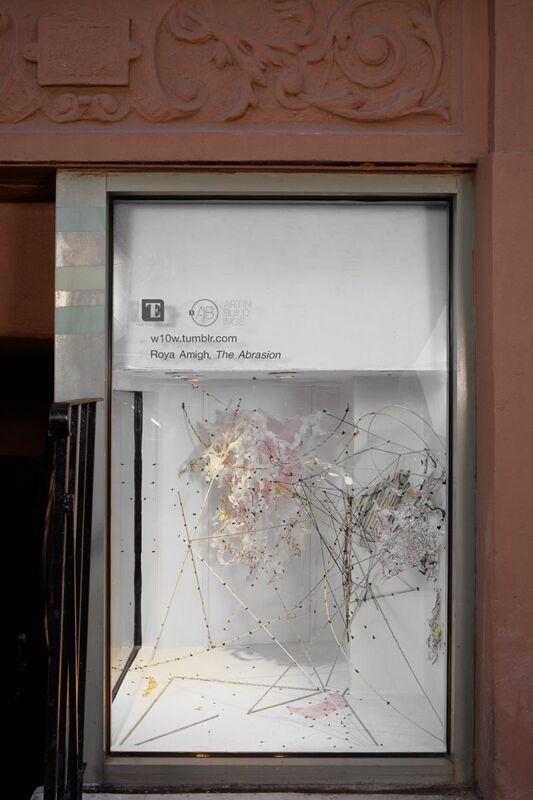 Roya Amigh's The Abrasion is an abstract representation of a survivor of assault, suspended in space by thread as a mass of paper and glue. 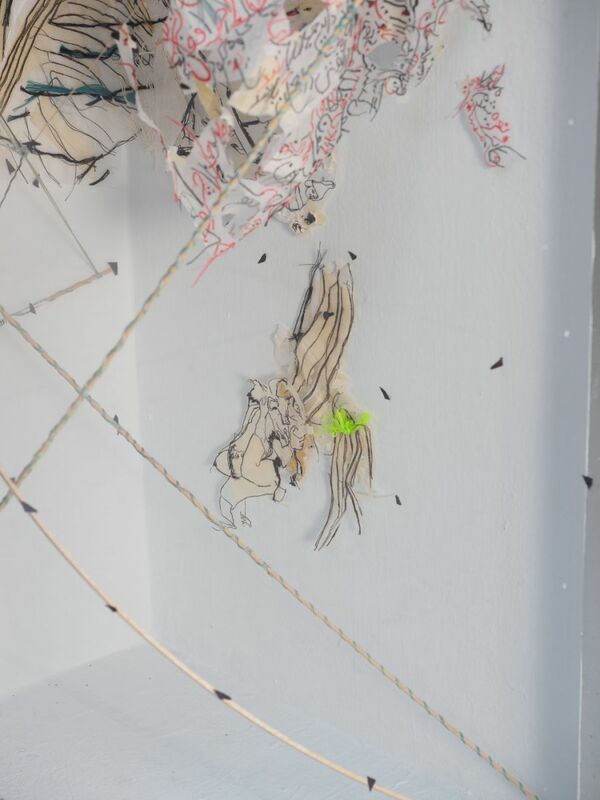 Like the violence imposed upon the body of a survivor, Amigh agitates the surface of the paper with scissors to produce rough marks and create a sense of flesh. 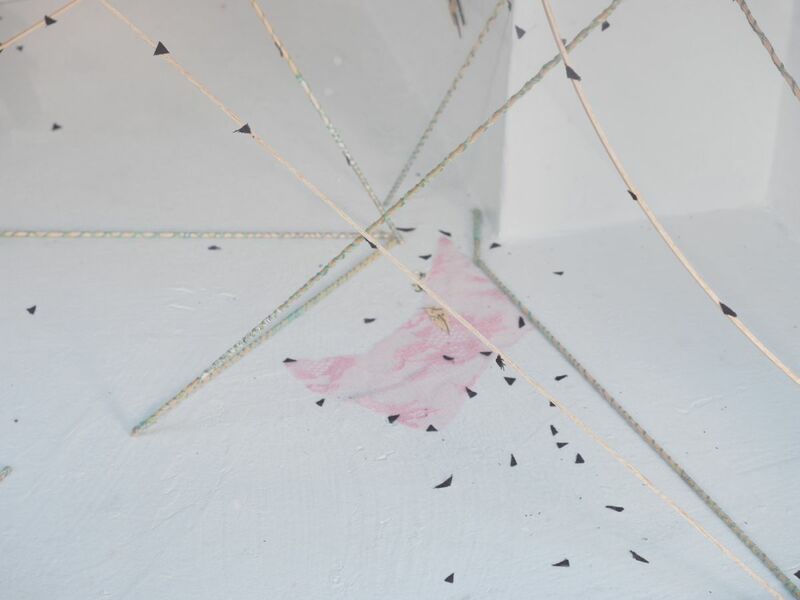 Amigh then tears the paper into smaller pieces and reconstructs them with glue to create two white, translucent surfaces, or skins, that are finally bound together with a strip of pink lace. 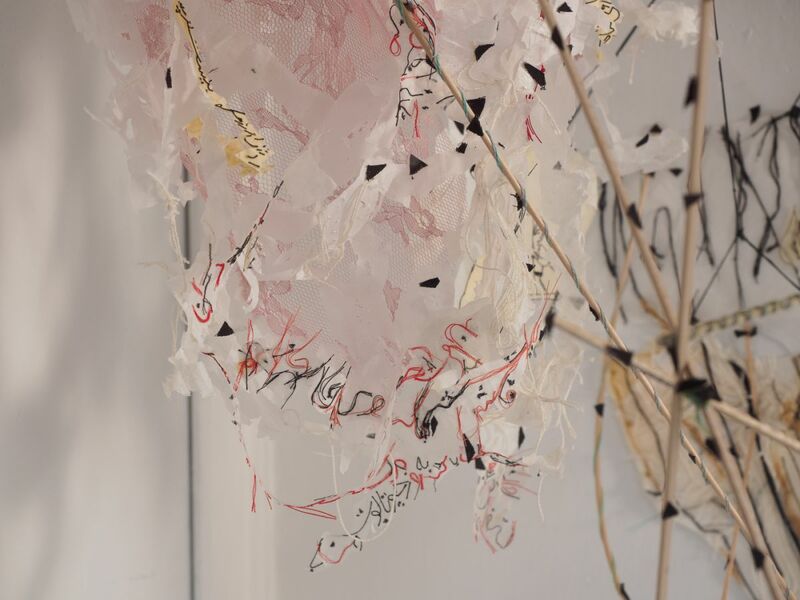 Formally, Amigh treats her paper with different types of glue to create varied textures and shades of white, while the delicate object hangs, almost weightlessly, suspended from the ceiling. 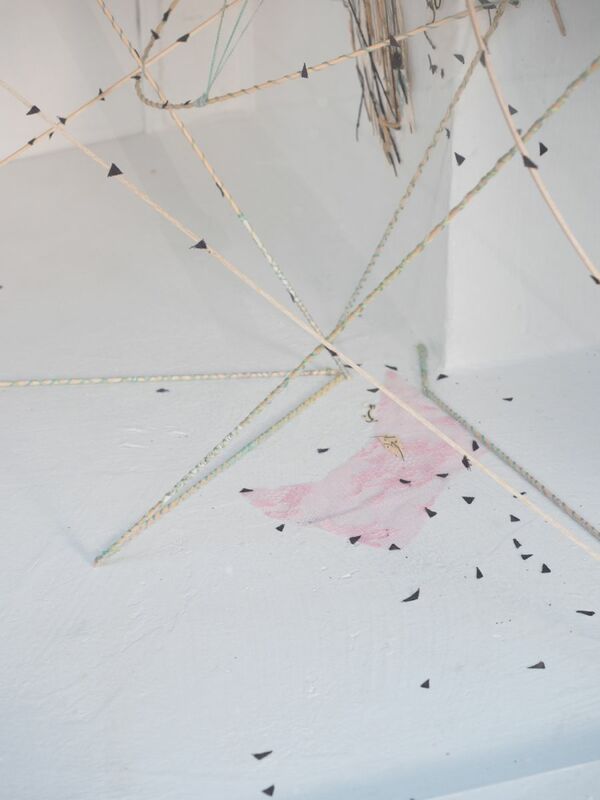 Metaphorically, Amigh's process represents the victim's desire to no longer inhabit her body and to leave it behind after a sexually abusive experience. 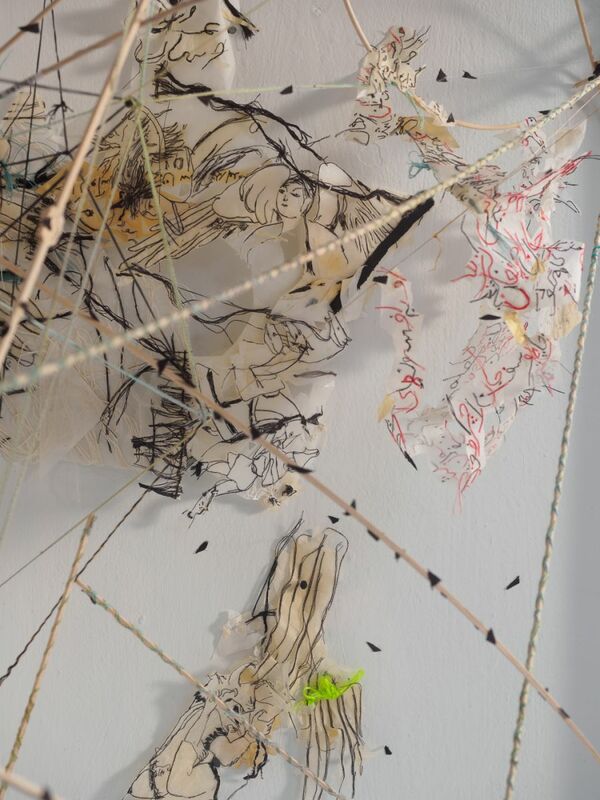 Born in Tehran, Roya Amigh grew up with Persian mythology heard in stories told by her uncle. Persian storytelling does not follow a linear structure, and is typically told by narration from one person to another. The line of narration can go on and on, from person to person and recounting to recounting, inevitably creating stories within stories and fictions within fictions. Echoing the natural distortions of memory, Amigh creates her own version of this mythology in her practice, featuring stories that happened to her or to the women she knows. 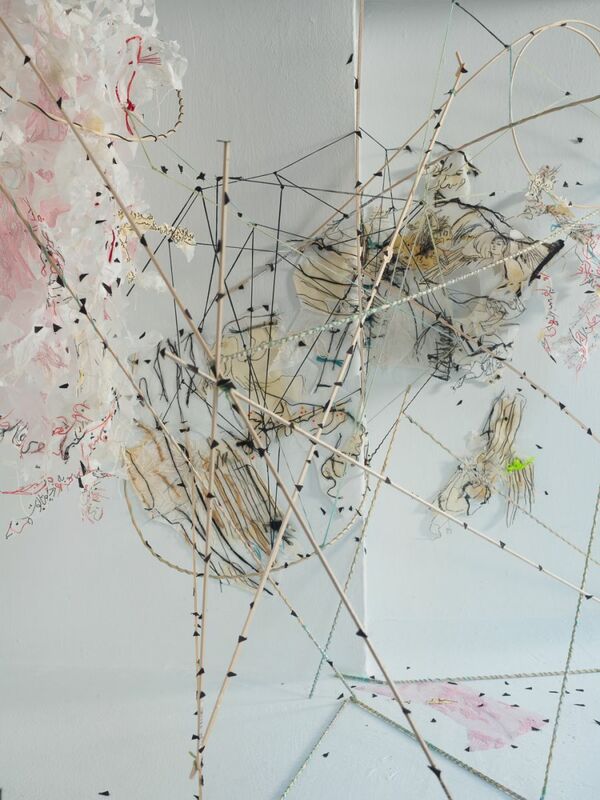 The delicacy of her objects reflects the ephemeral quality of a memory suspended in space. 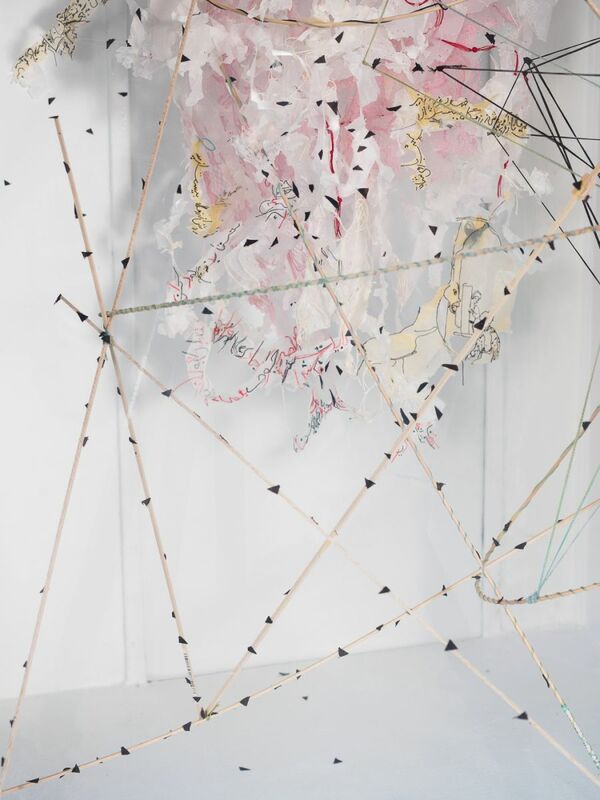 This fragility, the violence imposed upon the medium, and the ways in which Amigh mimics the desires of the victims she evokes is her own creation of a new, visual Persian mythology. Roya Amigh is an Iranian artist who earned a BFA and MFA in Tehran before completing a Master's in Fine Arts degree in 2012 at Boston University. 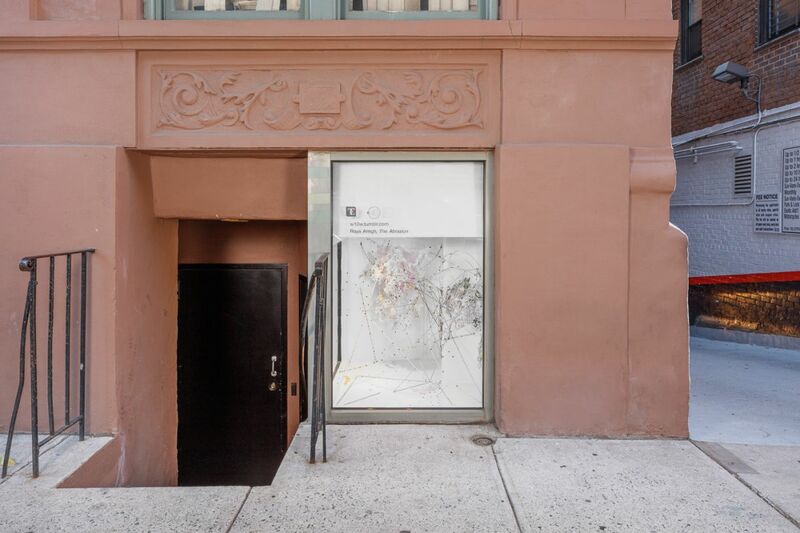 Roya's work has exhibited throughout Colorado, New York and Massachusetts. 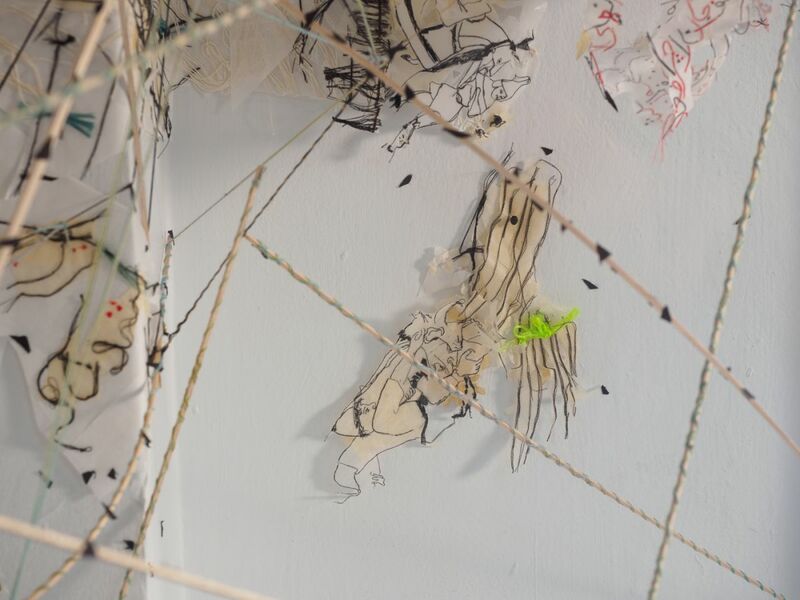 She has participated in various residency programs, including Art Omi, The Millay Colony for the Arts, and Vermont Studio Center. 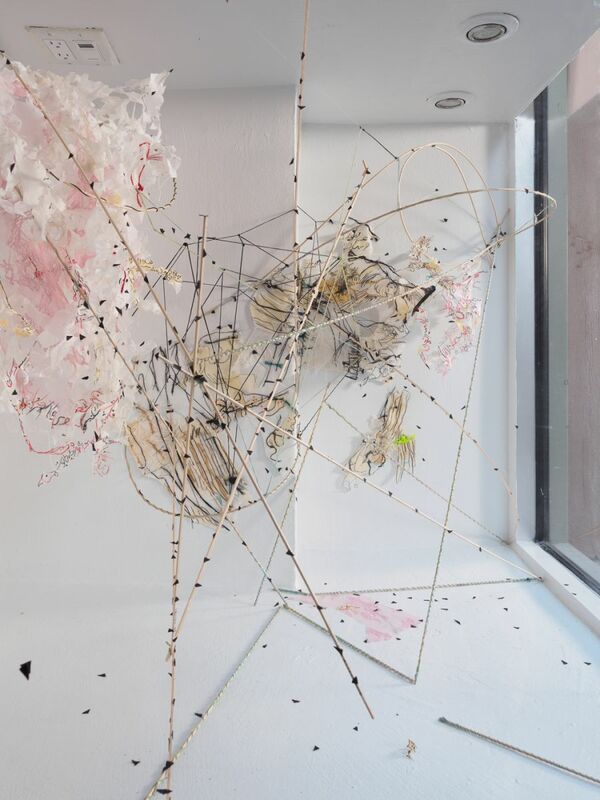 She was a recipient of Vermont Studio Center Fellowship in 2015, and Ruth Katzman Scholarship in 2014, and Constantine Alajalov Scholarship in 2010-2012. She is currently living and working in Boston, MA. 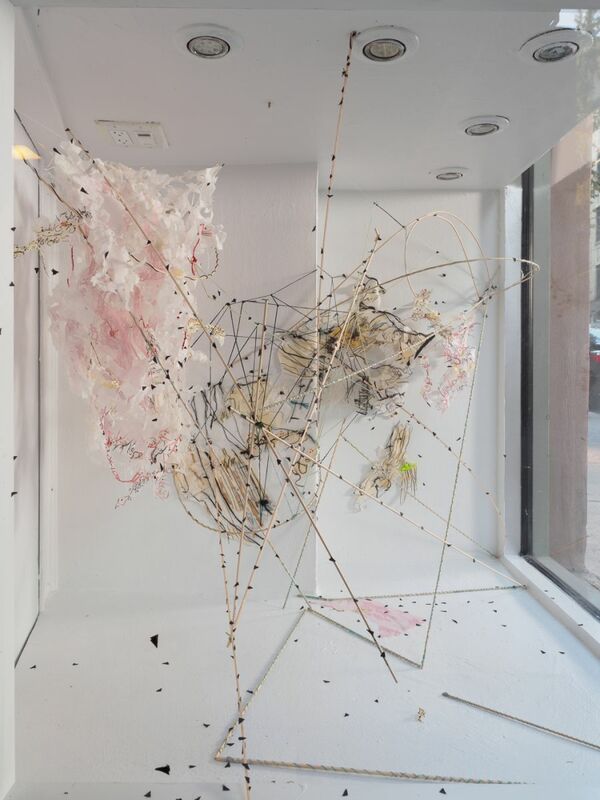 Next up at the West 10th Window: Daniel Horowitz, Doreen Garner, and Robbin Deyo. Learn more about Roya Amigh on her website! Read our interview with Roya Amigh on the Art-in-Buildings blog!